At first glance, you might think at-home denture repair belongs in the same category as Do-It-Yourself brain surgery and cloning your pet in the kitchen sink. But the fact is, you can actually buy a variety of DIY denture repair kits on line, send for them through the mail, even pick them up at some drug stores;you can even watch a youtube video on how to do your own denture repair. So if you’re feeling like Mr. (or Ms.) Fix-it, should you give it a whirl? First off, dentures are custom-fabricated products that have to fit perfectly in order to work the way they should. They are subject to extreme biting forces, yet balance evenly on the alveolar ridges — the bony parts of the upper and lower jaw that formerly held the natural teeth. In order to ensure their quality, fit and durability, dentures are made by experienced technicians in a carefully controlled laboratory setting, and fitted by dentists who specialize in this field. So just ask yourself: What are the chances you’re going to get it right on your first try? 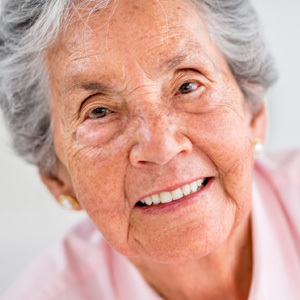 What’s more, the potential problems aren’t just that DIY-repaired dentures won’t feel as comfortable or work as well. Sharp edges or protruding parts could damage your gums, make them sore or sensitive, or even lacerate the soft tissues. And even if these problems don’t become apparent immediately, they may lead to worse troubles over time. Dentures that don’t fit properly can cause you to become more susceptible to oral infections, such as cheilitis and stomatitis. They may also lead to nutritional problems, since you’re likely to have difficulty eating anything but soft, processed foods. So do yourself a favor: If your dentures need repair, don’t try and do it yourself. Bring them in to our office — it’s the best thing for your dentures… and your health.